Now that the 2008 Scripting Games are over, I was wondering how the various scripting languages broke down in terms of individual participation. I contacted fellow MVP Marco Shaw about this a few weeks ago because last year he wrote a script that would generate a nice chart using PowerGadgets showing the breakdown of the 2007 Scripting Games participation by division for each country. He had been working on running his old script against this year’s results, and was kind enough to let me have his work in progress to experiment with myself (thanks Marco!). After tweaking the script off and on (more off than on) over the past few weeks I’ve managed to get the results I was looking for. 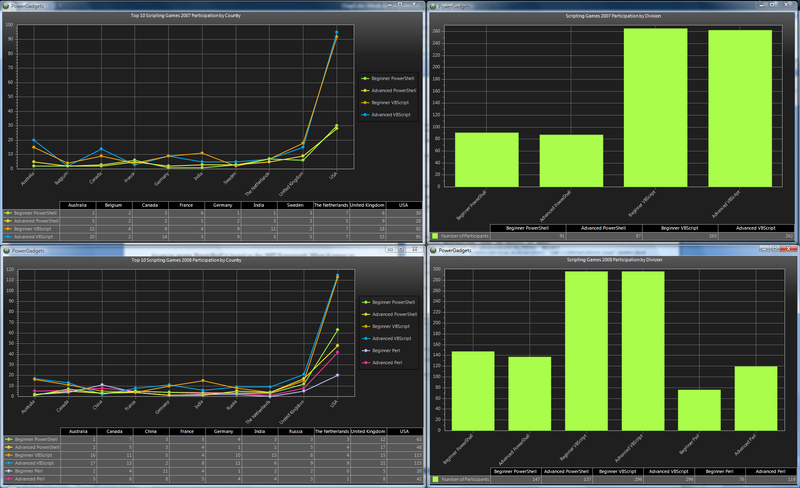 The following screenshot shows two charts from the results of each of the last two years of the Scripting Games, all generated using PowerGadgets. The charts on the left show the breakdown of individual participation by country for the top 10 countries (where the top 10 countries are defined by those with the most unique participants across all divisions), sorted alphabetically. The charts on the right show the number of unique participants in each division. The 2007 results are on the top, and the 2008 results are on the bottom. The results are pretty interesting. Not surprisingly, the charts show that PowerShell is growing in popularity. Last year there were 1/3 as many participants in the PowerShell categories as in the VBScript categories. This year that gap has narrowed, with PowerShell participation climbing to just under ½ of the VBScript participation. The charts also show that there were only two changes in the top 10 participating countries since last year, and that VBScript wasn’t the scripting language of choice in all top 10 countries in either year. In addition to the charts that are output, my updated version of Marco’s script also outputs some general statistical information for the years that it is being run against. From this I can see that the number of individual participants has increased from 510 in 2007 to 709 in 2008, with the number of active participants (where an active participant is defined as one that participated in 5 or more events) increasing from 378 in 2007 to 563 in 2008. The script used to generate these results can be found here. All in all, the Scripting Games seem to be increasing in popularity year over year which is likely a trend that will continue as PowerShell and other scripting languages continue to gain traction. It will be interesting to see how things pan out next year! P.S. One of the many things I was involved in while I wasn’t blogging during the month of February was the 2008 Scripting Games. A while back Scripting Guy Greg Stemp invited me to be a guest commentator for this years games (thanks Greg!) and I was assigned Advanced Windows PowerShell Event #5. While I unfortunately didn’t have time to participate in the other events this year, I did find some spare time during a train trip to Toronto so I wrote my solution for the event on the train. The games are all done for this year, but if you’re interested in my solution, it can be found here. P.P.S. I’m trying out using Windows Live SkyDrive as the site from which to share ps1 files. If you have any problem viewing the script file I’ve linked to in this article, please let me know. Previous Post Learn about PowerShell at Ottawa Code Camp 2008!